I brought these bars to a family gathering. Mike’s aunt turned 95 last week, her daughter invited some of the cousins to come and celebrate her birthday. When I asked what I could bring, I was told that I could bring some dessert. Since we had to travel about 4 hours, I wanted something that would be easy to transport, these bars fit the bill perfectly. I looked through a ton of recipes in Pinterest trying to find the right recipe. When I saw this recipe, I checked the pantry to see if I had a can of pumpkin and luckily I had one lone can left. Thank goodness I had bought a few extra cans of pumpkin back in November when it was on sale for Thanksgiving. The bars were super moist and they were enjoyed by all. 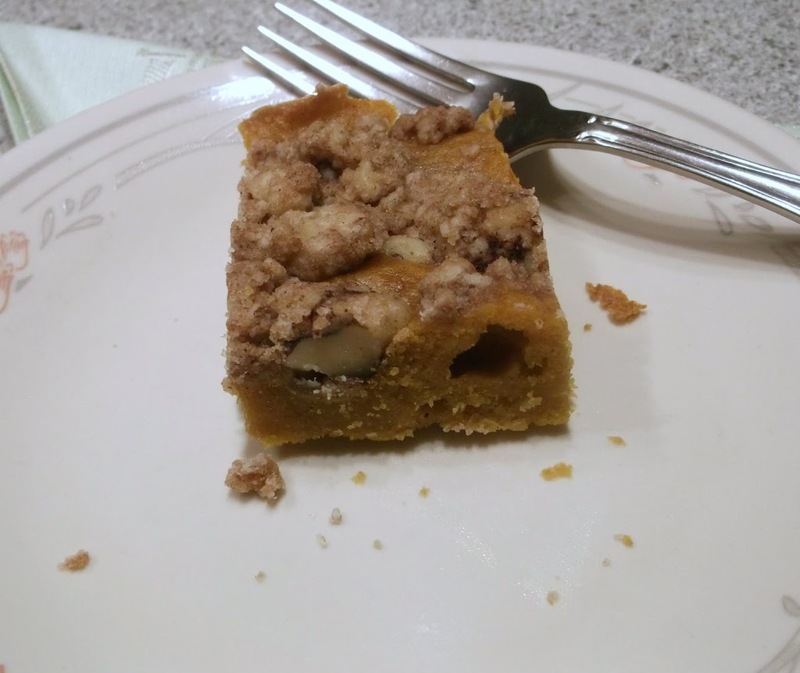 When Aunt Sis saw the bars she asked “Are those pumpkin bars?” It turned out that she likes pumpkin, so this was the right choice all the way around. The only thing that I would change the next time I make these is to use more cinnamon and ginger, I like the taste of cinnamon more than this recipe had to offer. And the ginger was not listed in the ingredients of the original recipe, I like the taste of ginger and had decided to add this to my bars. 1. Preheat oven to 350 degrees F. Grease and flour a 13×9 inch baking pan. 2. Mix together flour, sugars, baking powder, cinnamon, ginger, nutmeg, and salt in a medium bowl. 3. Mix together the eggs, pumpkin, vanilla, and oil in a large bowl. 4. Stir the dry ingredients into the wet ingredients and mix until blended. 5. Spread in baking dish. 6. Combine 3/4 cup flour, brown sugar, and cinnamon in a small bowl. Cut in the butter until the mixture becomes crumbly. 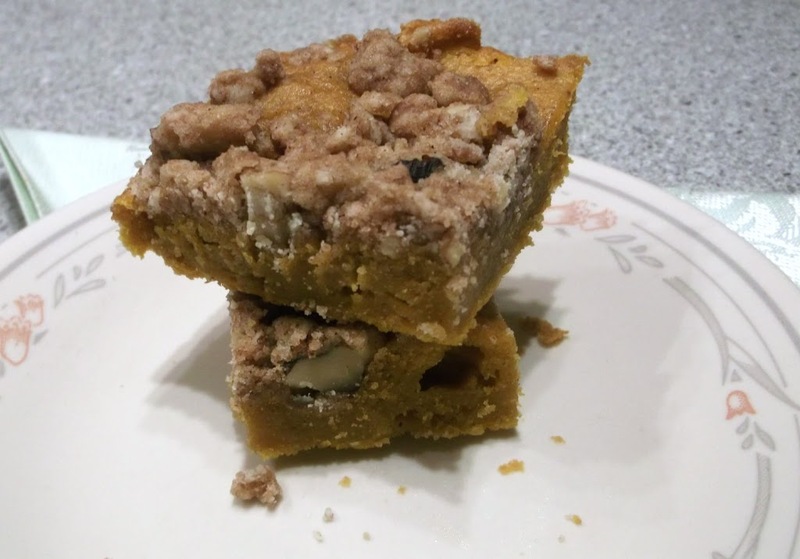 Mix in the walnuts and then sprinkle the mixture evenly over the pumpkin batter. 7. Bake for 25 to 30 minutes or until a toothpick inserted in the center comes out clean. 8. Cool in pan on a rack and then cut in squares to serve. 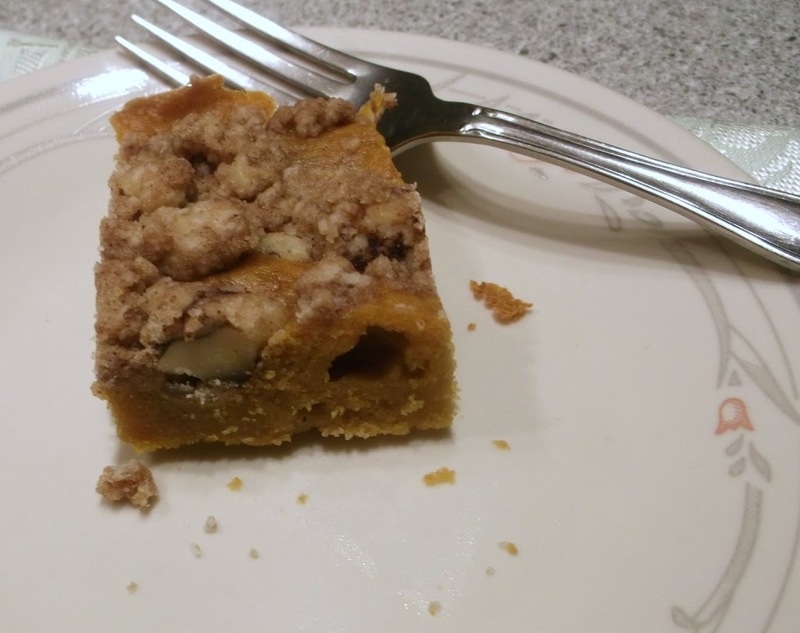 I love recipes that use pumpkin! Not a veggie I use often enough, and I need to – it has such great flavor. These look wonderful. It sure sounds like they’re loaded with flavor – thanks for this.